The battle of the dill ended in retreat - I took the single straggly stem that survived their last onslaught and planted it in a hanging basket. TRY TO GET IT NOW, YOU GERBIL WANNABES. I also got some lettuce starts, and now I have salad baskets that are safely out of their reach. (Last summer, I tried planting lettuce and it was gone in a day.) I also planted a few potato buckets, so hopefully we'll get a few dozen red potatoes in the fall. The weekend was pretty well lost to a garage sale, which was wonderful for getting rid of stuff and also put a few hundred dollars in my pocket. We could not have picked a better weekend - it was sunny and warm, with just enough of a breeze to keep mosquitoes down but not blow anything around. For clutter reduction, it was absolutely wonderful - I got rid of our crib/toddler bed, a dresser, an old chair, a sleeping bag, a set of skis, a bunch of clothing, shoes I'll never wear... just stuff. So much stuff. The people-watching was amazing. People bargained much less than I expected. Today, it rains. I cleaned up Guppy's bedroom, and did my chores, took some trash into town, got a load of water, and picked up the mail. After three days of no writing, I did get a little over 1000 words in an hour, so hopefully I can get caught up again. I have a piece of artwork for finish for a client first, though, and bellydance tonight. Today's artwork is a serious throwback. Like 21 years, throwback. I did this design in 1996 for Denali Science Camp, where I was a junior counselor. So many awesome memories! Now I have a pile of dishes to wash, and some chicken to cut up and cook for a pot pie tomorrow. UGH. This cold! I have wicked sinus congestion now, and my digestive system is protesting the volume of phlegm and cold medicine it's being asked to deal with. On the plus side, the aches are gone and I've got a ton more energy than I had a few days ago. Come ON immune system, let's kick those germs to the curb already. This is Olarali, of Torn World, writing secret coded notes in her journal. I went in to have a tooth cleaning today, and found out I had a cavity. It's better to fix cavities before you have to start talking crowns and such, so I said 'do it,' and they said, 'right now?' There was just enough time before I picked up Guppy to get it done, so I did, and then had a droopy face and aching jaw. I ditched the rest of the running around I was thinking about doing, and am honestly super grumpy right now. I floss every day, dammit. It was a crack, from grinding my teeth, apparently. And since I wear a night guard, religiously, it's daytime grinding. Here's the artwork currently on my desk. I'm finishing two coloring pages for a magazine feature, then I'll have one or two more to do. I couldn't pick SIMPLE things to do while on deadline, could I. No, I had to do tricky perspective, architecture, and insanely detailed pieces with multiple figures. I'm also getting a little writing done nearly every day. Sometimes that's just a few hundred words. Yesterday, I got about 1200... by getting up at 4 AM. Though to be fair, I thought I was getting up at 5 AM, because I hadn't set my watch to Alaska time yet. And also, I went back to bed and got another hour of sleep. Programming to tackle during naptime today. Crossed several things off my list this morning, including cleaning the bathroom, a trip to first care (no ear infection, horrah! ), and a bucket of ladybugs. My poor delphiniums are being eaten to nubs. Thursdaily - kicking off sea monster month! It's May! My favorite month of the year! And not just because it's spring and the sun is back and snow is going away and we've got birthdays and family coming! May is Sea Monster month, and I'm awfully excited. I have a new project to unleash at you next week, and we'll have lots of sea monster goodness at the site. You can catch up with things from previous years here, and I've got a new comic on the topic up here. Last year, I did 24 art cards, this year will be a bit different... you'll see on Monday! I showered and went out in public today, which was both awesome and exhausting. I still have a bit of a cough, but seem to be otherwise pulling back to health. We went to the library (libarry!) and got books (books!) and went to the post office and did a little shopping. The artist in me deplores the composition here - they aren't facing each other, she's running out of the frame, the log in the middle adds nothing, should have cropped out the white chair blob in the corner... but it's so much fun, who cares? Inbox is at 61, which makes me grind my teeth until I remember that about a month ago it was at 600. I can handle this. I can. I "accidentally" funded four coloring books through Kickstarter last May. I've been running a very small art business for the last 20 years, and one of my best-selling products has been coloring books, mostly aimed at grown-ups. I printed a solo coloring book in 2005 called Dotminatrix, and I had finally gotten enough work together for a second solo book. Unfortunately, the company I used to print with changed their cover format to a really thin stock that I was utterly dissatisfied with. I found a local printing company that could do what I wanted, but to get the pricing down to something I could afford to sell wholesale, I'd need to buy at least fifty at a time - 100 was much better. 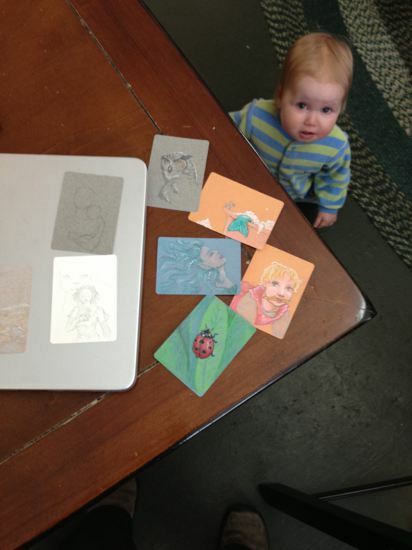 Did I mention I was a really small art business? I usually ordered 25 or 30 of a title to start with, then got 10 or so more at a time as I needed to. This was a gulp-worthy investment! I figured this was a good test of the Kickstarter site; it was a safe way to see if there were enough people interested in the coloring book to make it worth a purchase like that, and it saved me the hassle of having to store a whole bunch of books I didn't sell. Did you find this useful? Would you like to see a followup article? Comment or donate to keep content like this coming! This is a first glimpse at a project I am incredibly happy to be involved in, Seventy Eight Tarot. 78 artists! 78 cards! But that's not the only art! My inbox is at 74! Rah! Rah! There are three new portraits, by two new artists, up at Portrait Adoption! I have new artwork up at Torn World! I got nothing done today that I wanted to. Except shopping. Tomorrow: bread! And catbox! And taxes! And mailing of things! I am triumphant! I have taken the coding project I have been poking at, beaten it sideways into shape, cleaned it up, and have turned it into something elegant and clever. All a day ahead of schedule! I feel quite chuffed with myself. I have also leveled up in loops. Significantly. If I can manage two sketches, I will have made my year's goal for getting two for each Sketch Fest in 2013. That is admittedly a modest goal, but one I feel pretty good about accomplishing. On that same list of goals, I have a whole lot of unmet writing goals. One I think I can reasonably still make is the short story count: "25 short stories - at least 15 of which should be Torn World Big Plot stories and 2 of which should NOT be Torn World stories." I currently have 19, all of the Torn World Big Plot stories. I did exactly NO writing in October or November. I was pretty burnt out on the series and got some legitimate but discouraging feedback that the last bits weren't much of a page-turner. I have gone back and found a few nice comments that were left throughout the earlier installments, and refreshed myself on the plot, so I hope to get back in and spice them up a little, as well as get the rest done, but I'm not going to tackle that until next year. That leaves me 6 stories - 2 of which should NOT be Torn World. I could count the story I wrote for RTH that ended up being set in the wrong time and all backwards-like... if I do, there are still 5 due. I am going to aim for some flash fiction - maybe even drabbles. Maybe Jenny/Bjorn things? I feel writing-rusty. Any requests? I won't do anything formal like a prompt call, but if there's a sequel, prequel, fandom or anything that you'd like to see something short in, just ask! In Guppy-stories, she's started saying "EW" when she wants her diaper changed, which is silly and funny, but totally appropriate. We count everything now, but she's sort of stuck on two and five, with the occasional guess of nine. Also, she doesn't like ham. This may be the first meat she doesn't like. What's your favorite zucchini recipe? I made a lovely bread with chocolate chips that I will do again, and I'm planning to try Turkish Zucchini Pancakes - what else have you got for me? Savory, sweet, anything! We aren't lacking in zucchini to experiment with! Progress has been made on my last Fantastrix piece - I erased the three dragons in the foreground entirely and scaled them up to give the piece more of a sense of depth, and I like it a lot more now. Some experimentation with dragonscales, but I think that's a blind alley - I'm not really happy with the results and will probably fall back on stuff I know works better. There's a blizzard in Atigun pass and it's raining like crazy here today. Thank HEAVENS for driveway rock. Also, the signs of fall are making me pouty. On my walk last night, I spotted several branches with leaves turning colors already. The raspberries that are left on the plants are getting well past ideal, and the cranberries are turning brilliant red. Our garage is underway! The slab is nearly ready for concrete, though the rain is keeping the contractors away today. I should take photos, but it's raining and I'm warm inside. Okay, I need more food and it's time to get more done. 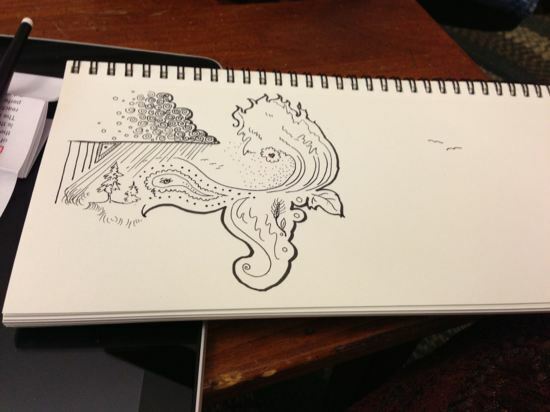 Lack of sleep seems compatible with creativity... This time! Did this last night to play with my new pens before falling into bed. Yesterday was an unexpected weekend day, because Jake's calendar said so. Productive weekend, if not a lot to show for it - lots of little repairs... we installed a light above the kitchen counter, I fixed the handle on the chest freezer and re-repaired the KitchenAid. Much cleaning, good food, and a long walk for me and Norway. It's colder today - under zero! - so there's a cheerful woodfire in the stove. I left Rails alone all weekend, though I moped about it whenever I remembered it, and opened it with trepidation again this morning... to find that it's not at ALL as bad as I'd built it up to be in my head. I made a few cosmetic changes, tweaked a few conversations just a little, and decided it worked. Is it perfect? No. But I don't think I got far from the mark I was aiming at, and it's engaging. It's totally set up for a sequel or two, it ties up just exactly what it HAS to, and I think it does the characters justice. Done! Just need to ebook it up and think about Kickstarting a print copy. The next section is up to the public in Railbrakes. Muse Fusion is this weekend, Sketch Fest is next weekend! However! I'm going to take a brief media switch and do some artwork to clear out the cobwebs. I finished a commission, which I need to get scanned, and then I have some painting to do. (Color, must do more color!) One of the things on my 2013 goals list is to do more work for PA, and I have a fun crowd-sourced idea for that to pursue next week. Guppy's down for a nap - my chance to paint! I hope your day is lovely, warm and full of love and all the best things in life. Woke up weirdly and am not exactly on top of things yet. Should be coding or writing while the young wookie is asleep, but my brain is really not moving yet. The new bits of code at Sketch Fest seem to have functioned all correctly. I added a 'cancel' function to my admin page for dangling sales that never come through (which will change the count on the product correctly, too), and set it up so I can assign a sale to a registered user, in case they weren't logged in. Working on a 'pay by credits instead' function for buyers who accidentally picked the wrong kind payment method. I have some more sales to approve and some payments to send today - I'll do those as soon as I'm finished here. A bit stalled on writing. Got big chunks of the LAST two installments written, then got some feedback on one of the bits in the queue that it really didn't work, so I may have to go back and fill in a scene that I was hoping I wouldn't have to (equal parts laziness and wanting to do a reveal from a specific POV). So now I have TWO parts of story that I really really need to go write before I finish, and my muse (and bruised ego) is digging in her heels. It was coooold this weekend, about -30 most of the time, and that following a big dump of snow (18-20 inches). We got the driveway cleared before the it cooled down too badly, and uncovered the wood. So, we're perfectly cozy inside, at least. I got orders out, and Christmas cards printed (but not yet mailed), and generally had a nice weekend. In the lower right hand corner is the weather station, piled high with snow, and Norway is the dark speck by the tree in the back. Guppy is doing awesome. We added lettuce to her diet last night, and she thought that was great fun and ate it all. I gave her some of my pork the day before, and she gobbled that up, too. I'm a big fan of these finger foods where she feeds and entertains herself all at once. Her fine motor skills are doing great and the faces she makes are wonderful. (Didn't have my camera handy, you'll have to imagine them.) I LOVE being able to eat while she does. Alright, brain may be working now, ought to do something productive while Guppy is still sleeping.